Deb's Cup of Tea: Free at last! Sunday morning and I'm seriously thinking the gods or Mother Nature hate me. It snowed overnight. Pretty much any other time, I'd be ooh-ing and ahh-ing. Today, I was cursing. It wasn't just a light dusting either. It was 3 friggin' inches. To say I was a bit disheartened is something of an understatement. 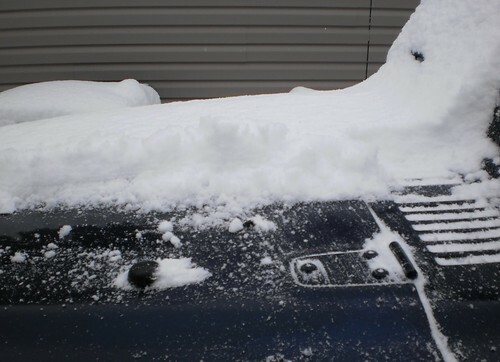 But, I pulled on my socks, my pants, my sweater, grabbed my shovels, which I've left on the deck, and trudged out to the street, after sweeping off the Jeep. The task at hand was to widen the entry so it would be easy for anyone to get into and out of my drive. Add a three inch coating of fresh, fluffy snow and the plow having gone by and this wasn't going to be a quick 30 minute task. Slice off a bit and break it into chunks while around me came the whirr of snowblowers being fired up yet again. Nope. No one came to blow out what had fallen overnight and I knew they certainly weren't going to come help finish off this last little bit. Sorry if I don't acknowledge you when you drive by and wave. Actually, I'm not sorry. I'm too tired to acknowledge you. It took roughly 40 minutes to reduce this wedge to something reasonable. 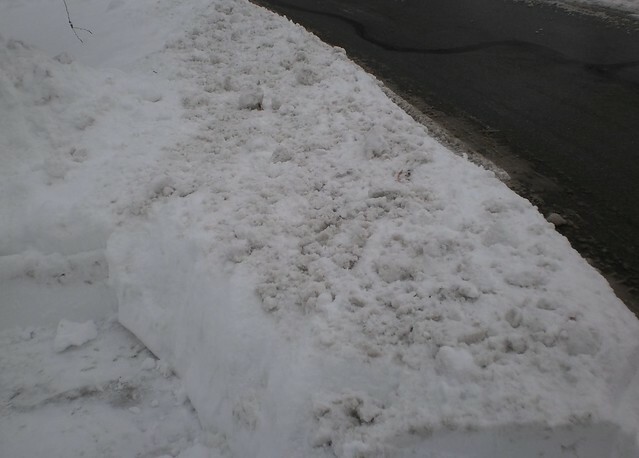 I stood in the street shoveling and forced people to slow down and to look. Yes, I'm feeling a mite peckish but this was quite ridiculous that no one, not one neighbor, offered to help, even for an hour. 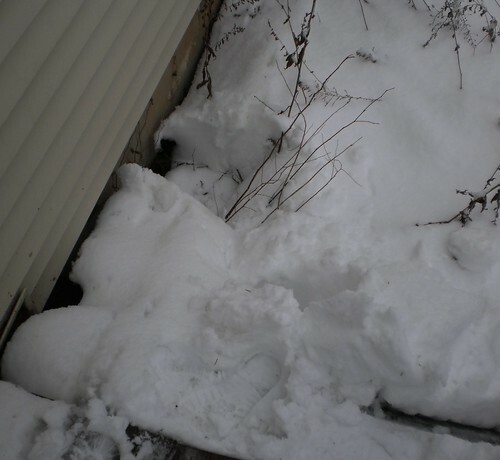 The best I got was an "I hope I can get my blower working, but my back won't let me help." Once this was done, I aimed for the mailbox. I knew I had to get this shoveled or the mailman wasn't going to deliver. 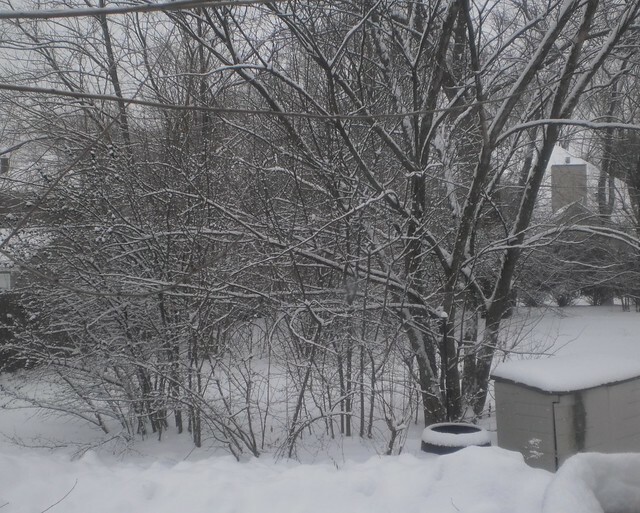 "Neither snow, nor rain, nor dark of night" doesn't work after a blizzard. If they can't get to your mailbox, they don't deliver. That took another 45 minutes because this was through the 4 foot drift that went into a 3 foot drift. The path is wide enough for one person to walk easily. I got over to the front walk, but I was fast running out of energy. I cleared around the mailbox and removed mail from Thursday. It was all junk mail. I simply tossed all of it in the recycling can as I came inside. 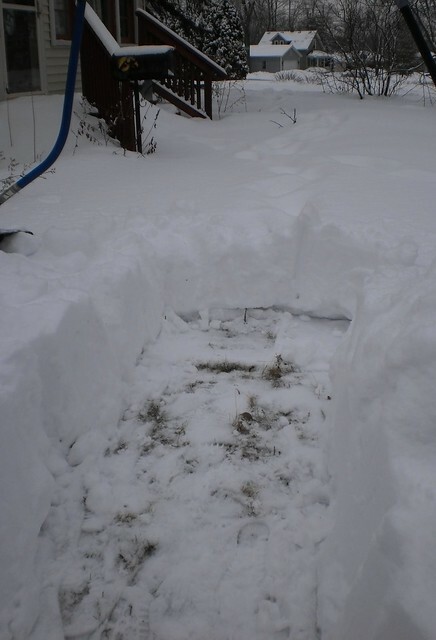 Then, I opened the front door and shoveled off the top of the steps and the first step. While shoveling, I heard the snow hit something odd. Looking north of the steps, I found this in the snow up against the house. 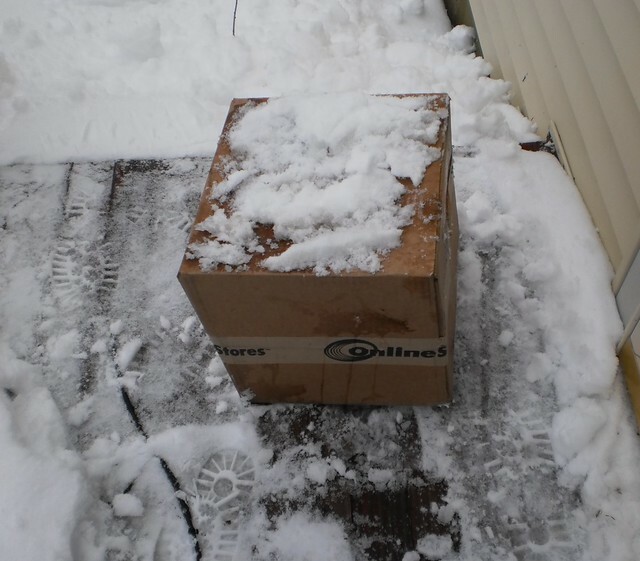 I have no clue how long it's been in the snow, no clue on when it was delivered. I haven't gone anywhere since getting home on Tuesday. Only once was the doorbell rung and that was Thursday evening when that neighbor wanted to charge me $80 to shovel my drive. I found it here. The box was rather soggy and there was a slight rattle to it. I'll post tomorrow (Monday) what was inside. 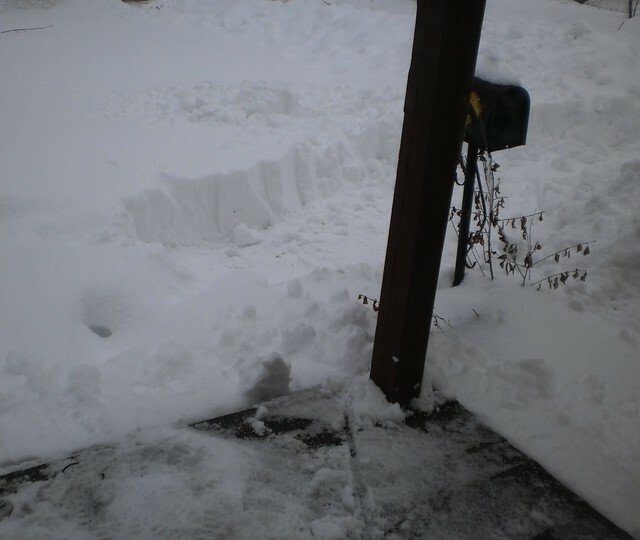 After one hour and 45 minutes, the drive was opened, a path carved to the mailbox and the top and first step of the front steps shoveled. I was beat. 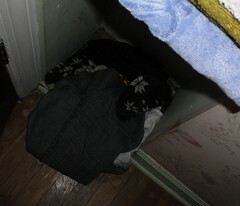 The best part of all of this, tossing those clothes down the laundry chute. It has snowed off and on all day now. The plow has gone by a dozen times tonight. I haven't looked to see how much more we got. Part of me is a bit scared to find out it might be more than 4 inches. But, 6 or under, I'm just driving through. I'm taking a day off from shoveling. 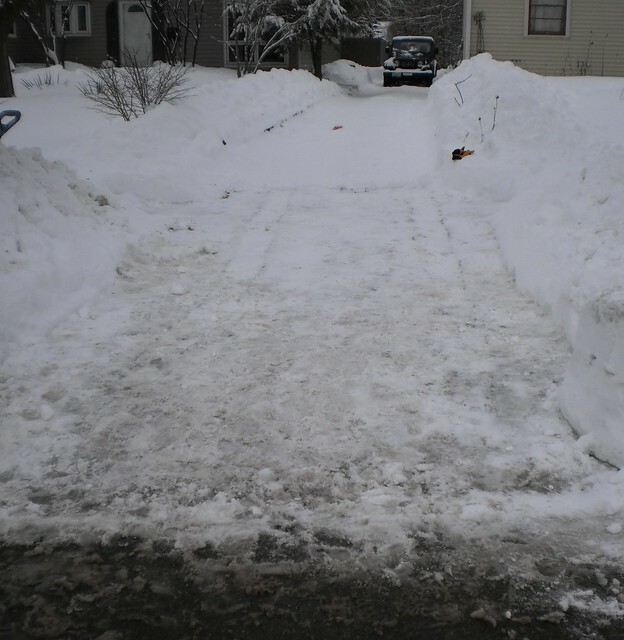 Then, on Tuesday, I will go out the front and liberate the last 2 steps on the front and start the slow process of shoveling the sidewalk. I'm only going to work for a half hour every day. I missed 2 days of work so I have to work overtime to get things done. It has been quite the adventure. I'd rather not repeat it this year. The view from the street. Today's paper was delivered, much to my surprise.